We received a news release recently where the lead said, “Bring on the authentic flavors of Mexico, Spain and other Latin American countries; Americans are ready!” And at LatinoFoodie, we couldn’t agree more. According to a recent report on Hispanic food and beverage trends released by Companiesandmarkets.com, non-Hispanic Americans have developed an increased appetite for Latino cuisine. The rapid growth in America’s Hispanic population has also lead to increased demand for authentic Hispanic and Nuevo Latino foods. California is the number one producer of Hispanic dairy products in the country, offering more than 25 varieties and styles of Hispanic-style cheeses bearing the Real California Cheese seal. 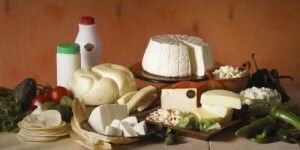 The California Milk Advisory Board makes it easy with an at-a-glance tip sheet on Hispanic cheeses found at www.realcaliforniamilk.com and recipes for using these delicious ingredients at home. This weekend, we’re going to check out this recipe below. We’ll let you know what we think. Anyone else out there ready to give it a go and share with us your comments? We’d love to hear from you. Whisk together eggs, milk, cumin and salt. Heat a griddle or skillet over medium-low heat; coat with a thin layer of butter. Dip bread slices into egg mixture, turning to coat on both sides. Transfer bread slices to griddle or skillet and cook, turning once, until golden brown on both sides. Place on a baking sheet and cover each slice with ¼ cup cheese. Place under heated broiler until cheese is melted. For each serving, place 2 slices toast on a plate with ¼ cup salsa on the side.